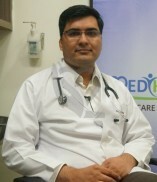 Dr. Amit Bishnoi M.B.B.S, M.D (Paeditrics) is a Consultant Paediatrician at Alchemist Hospital, Panchkula. Prior to joining Alchemist, he was Consultant Paediatrician at Children’s Hospital, Panchkula . Besides this, he had career stint as an Assistant Professor in Paediatric Department of PT. B.D. Sharma, PGIMS, Rohtak . Dr. Bishnoi has accomplished his basic medical studies (M.B.B.S) from Sardar Patel Medical College, Bikaner and his M.D. in Paediatrics from the world famous Post Graduate Institute of Medical Education & Research (PGIMER), Chandigarh. Thereafter, he has undergone three years Senior Residency at K.S. Children’s Hospital, L.H.M.C., New Delhi. Dr. Bishnoi has special interest and exposure to neonatalogy. He is proficient in all the aspects of Paediatric care including blood sampling & paediatric resuscitation (PALS). He can manage all critical illnesses related to both premature & sick newborns with the aid of ventilation & dialysis. He also has expert skills in managing various paediatric diseases and emergencies independently like Severe Asthma, Shock, Status Epilepticus, Raised ICP, Foreign body airway obstruction (FBAO), Cyanotic spells, CHF, Diabetic Ketoacidosis, poisonings, Acute Renal Failure etc. Dr. Bishnoi is not only proficient in his professional field, but also was dynamic academician. During his academic years of post graduation, he vigorously participated in workshops and attended various conferences on advance paediatric care. After this, he has successfully accomplished Pediatric Advanced Life Support (PALS) provider course in accordance with the standards of the American Heart Association. Dr. Bishnoi has proved himself as a brisk & a lifelong seeker of knowledge. In the course of his Senior Residency, he completed the National Faculty Training course on Neonatal Advanced Life Support (NALS). Apart from this, he has achieved Basic Life Support( BLS) Provider Instructor Training Course & attended first national level “Neonatal Resuscitation Program (NRP) Simulation Workshop”. To Dr. Bishnoi’s credits, he has been honoured with the prestigious Sh. V.K. Gujral Award for the most efficient & Sympathetic Senior Resident in Paediatrics for the year 2009-2010. Withal, he has contributed research papers in various international & national journals and has presented his research work at International as well as National level conferences. His goal is to excel in the field of paediatric medicine and serve the community wholeheartedly. He believes that managing child is like caring the entire family because a child is epicentre of it. So his goal is not to treat a medical illness but to take care of family holistically as well.